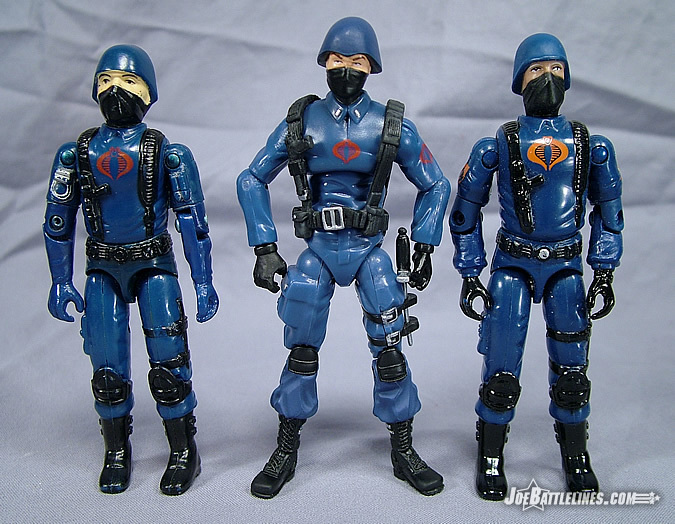 I’ve always loved the original Cobra Troopers. In fact, I’m so enamored of them that I believe I open every review involving them with the same sentence. 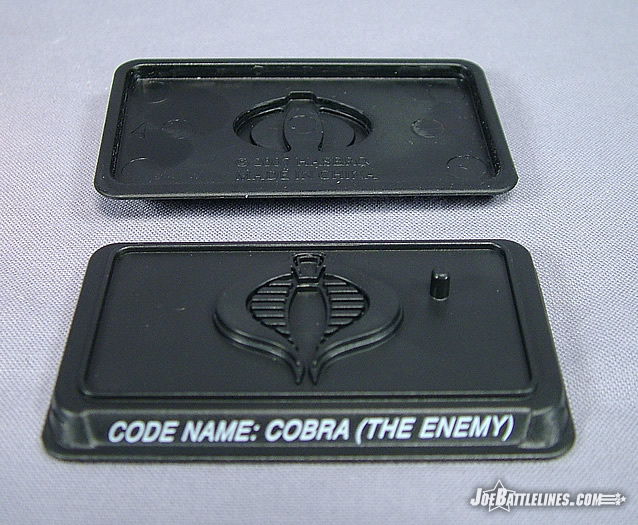 It’s also when I went a bit nuts when Toys R Us had their Cobra Infantry Forces six-packs a few years ago. It’s really not my fault (says the obsessive compulsive)—I only ever had one “blueshirt trooper” as a child so I’m spending my adult life compensating for that perceived loss. (Wow, Freud would be having a field day right now.) 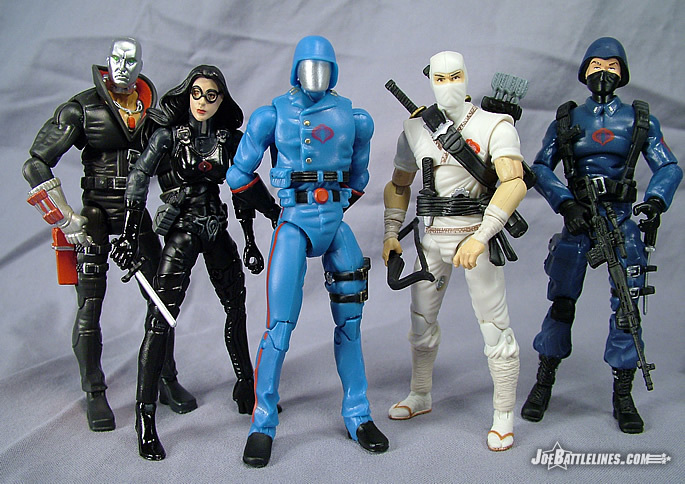 Regardless of whatever issues this writer might possess, I was positively giddy with anticipation when it was announced that the first Cobra battle pack would include the classic trooper. 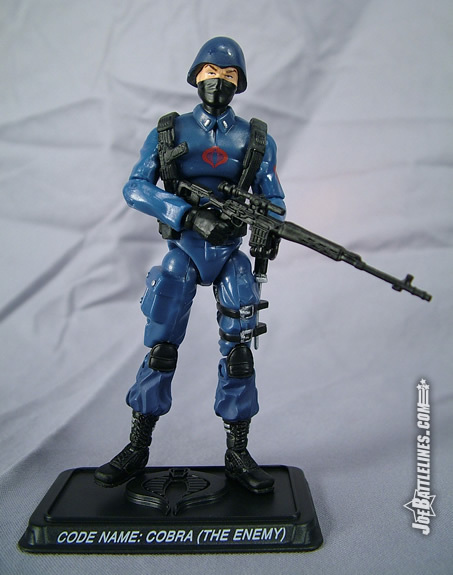 I was a fan of GIJoe before the concept of the Viper was introduced and so the “blueshirts” have always been the “faceless hordes of Cobra” in my mind. 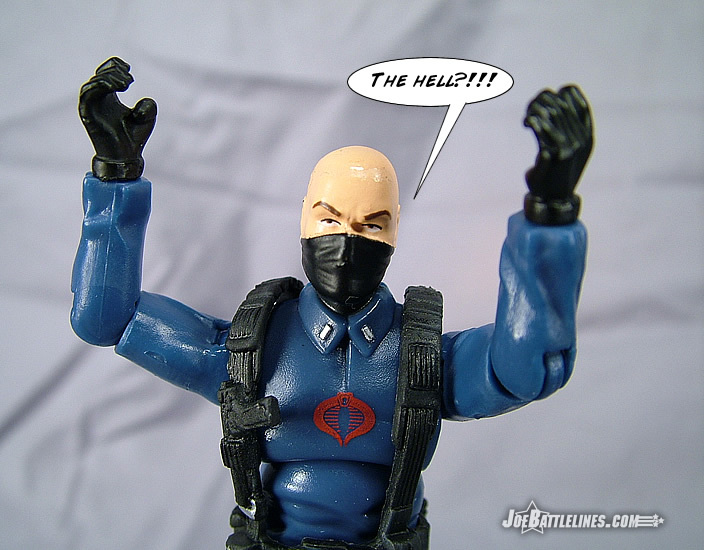 So, you can imagine my excitement as I freed this figure from his plastic prison and began to examine “one of the most poseable Joes ever”, right? Right? I believe in giving praise when praise is due and the sculptors at Hasbro have earned their laurels when it comes to the character design for this figure. This figure could have literally stepped out of the original trooper card art and been immediately rendered in plastic form. The basic yet distinctive uniform is rendered in near-perfect detail, from the creased collar right down to the kneepads and knife sheath on the left leg. In fact, this design might even be more realistic than the original in the amount of “fabric” detailing sculpted into the torso. Previously the trooper’s shirt reminded me more of a long sleeved t-shirt with a collar as there was no visible seam down the front of the chest. Now, a sculpted line clearly descends from the collar to become lost in the wrinkles on the lower chest. It’s a nice extra detail that only accentuates an already solid character design. The sculpted suspenders have been replaced with a molded removable battle harness that still carries the signature pistol on the right hand side, as well as a few utility pouches for those tasty Cobra rations. 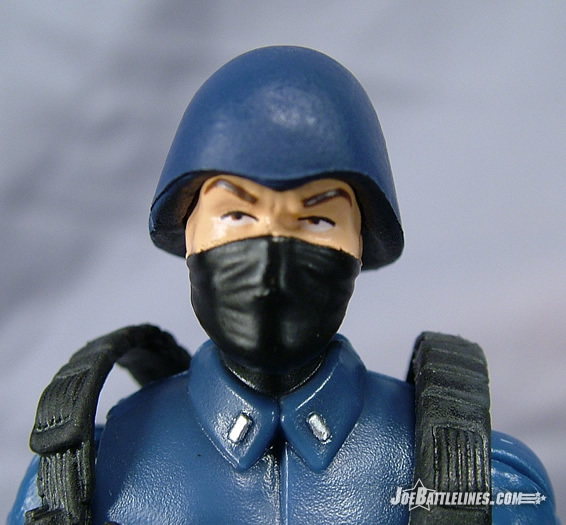 This particular figure follows the example of the TRU blueshirts in the respect that the troopers’ gloves are painted black, a detail that was never found on the original figure. 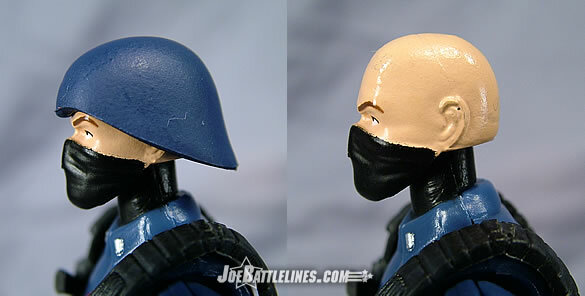 The entire body is molded in the dark blue plastic with the exception of the softer plastic lower legs, which are molded in black to match the boots. (The bottoms of the pant legs are painted to match the rest of the uniform.) This figure possesses the double-jointed knees that are utilized by many other figures in this line—except that the knee piece is sculpted black to simulate the knee pads. This is a particularly well-thought out piece of design work that shows what Hasbro can do when they put their full efforts into something. (Sadly such effort is fleeting, as I’ll discuss later.) 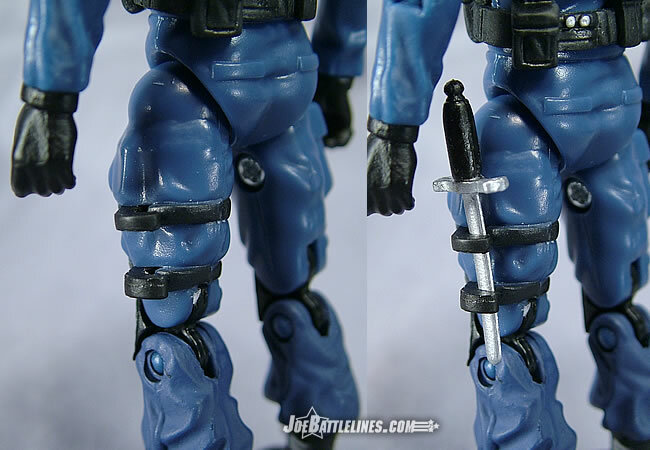 As the trooper is packaged with a combat knife, a small sculpted sheath is set on the left leg where the original sheath was molded. This is another great detail which can only add to any sense of appreciation for the design work. 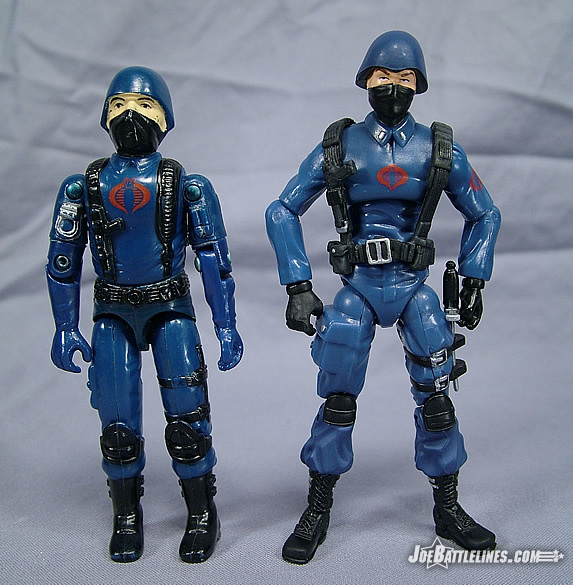 The signature Cobra logo is painted across the figure’s chest as well as on the left arm; the chest sigil is a bit smaller than found on previous incarnations of the “blueshirt” but the logo is quite well done otherwise. When it comes to the character design I can find no faults. Here we go—the portion of the 25 th Anniversary reviews where I showcase the design flaws and “room for improvement” found on each figure. (This won’t be nearly as long of a tirade as featured in the Gung-Ho review but you still might want to be seated comfortably and quite possibly you should have a beverage ready.) 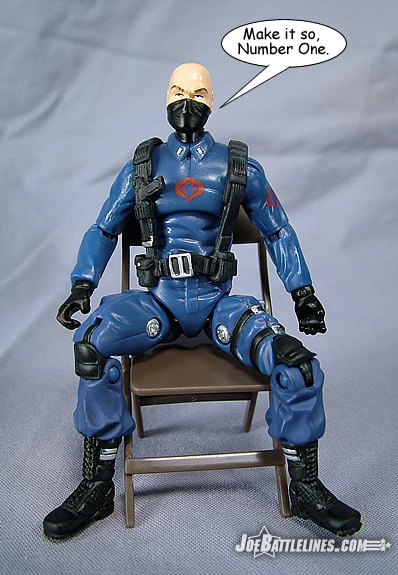 Like many of his compatriots, the Trooper has issues sitting down. Unlike most of the other “slouchers”, this figure can actually manage to sit “mostly upright”. In fact, I’d even go so far as to say that his spinal positioning isn’t the problem—his “diaper crotch” is. For whatever reason, Hasbro didn’t really work out all of the kinks in this new style construction before rushing them into production. Case in point—the trooper cannot sit with his legs closed. He can sit and he can sit up straight, but there is no way that he’ll fit into some of the tighter cockpits found in many of the classic ARAH era vehicles. 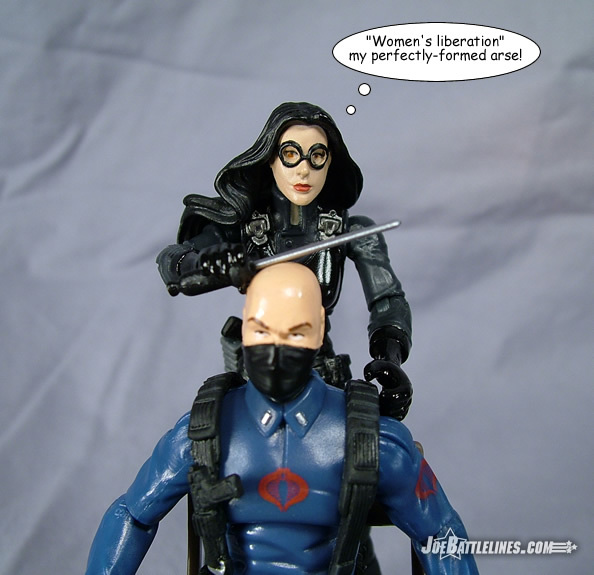 In many ways, he shared the same issues as “v-crotch” figures—many of which were female as designers didn’t want to break the “feminine lines” with “unnecessary articulation”. However, the Trooper has one even more critical flaw which pretty much trounces any true usefulness he might have had outside of static display. The trooper shares the same ill-functioning elbows with Duke and Gung-Ho which means that a plausible two-handed grip on his rifle just isn’t happening. Sure, he can manage some fairly dynamic “action poses” but there is no way a simple “standing guard” pose can be achieved. Considering that this figure is the only real “army-builder” that Hasbro has in the line thus far, this is a real issue for me. Had this figure lived up to Hasbro’s PR hype, I’d have been snagging these as fast as I could find them. (I’ve got “quite a few” of the TRU Troopers in my basement now.) However, his limited articulation has reduced him to nothing more than straight eye candy and I only need one of those. The sad thing is that I’m not alone—had this figure had the most time and attention devoted to him, collectors would be swarming over them. Now, Hasbro is going to have to retool the mold adding further developmental expense to this anniversary concept if they wish for this line to gain widespread acceptance. Unfortunately, with the economy and the state of the toy industry being what it is today, I just don’t see that happening. This is yet another example of the “form over function” approach that the folks in Pawtucket seem to be taking toward this entire line. Honestly, next to Gung-Ho this figure is my biggest disappointment in the entire line and the second worst figure in this set. The trooper looks fantastic and really makes a great first impression right up until anyone tries to pose him. Suddenly, the “bright and shiny” figure is suddenly a bit tarnished and those classic troops on the shelf aren’t looking so old and shabby anymore. Sure, they aren’t the most realistic figures in the world by today’s standards but in 1982 they were pretty darned snazzy and they’re still more poseable than this particular soldier. I’ve said it before and I’m sure I’ll say it a few more times when reviewing this line—the new figures should not be less functional than the original source material. Plain and simple, this figure is akin to a student who “sort of” did his research for a presentation and “sort of“ looked up a few sources. It might sound informative at first but it falls apart under closer scrutiny. I wouldn’t rush out and buy multiple sets for this figure at this time. We can only hope that Hasbro learns from their missteps and figures out a cost-effective way to fix this trooper in the near future.